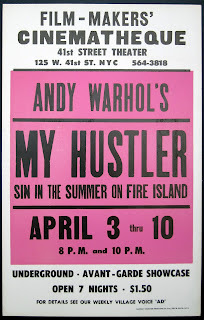 Andy Warhol's My Hustler consists of two 33-minute long takes, each a full 1,200 foot reel of 16 mm film exposed continuously. 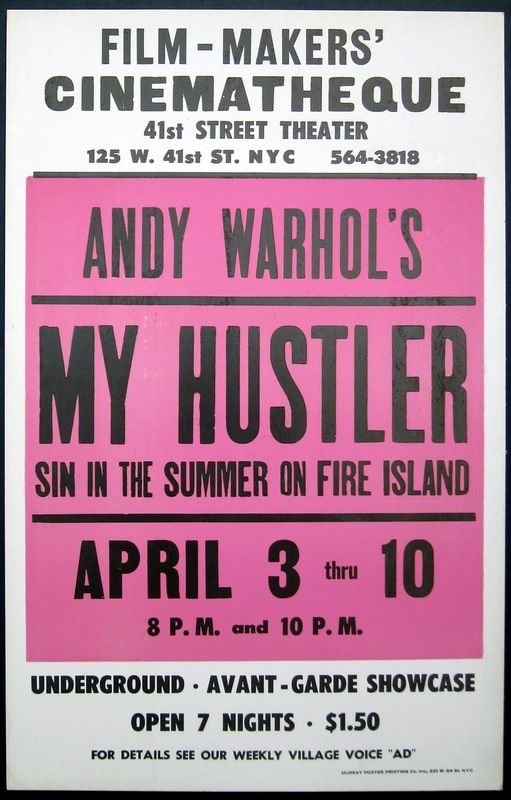 It was filmed on Fire Island in 1965 in a shoot that is notorious because just about everyone on set had taken LSD. Apparently someone had spiked either the scrambled eggs or the orange juice and though Warhol himself denies having been affected, there are wildly differing accounts of the day and few, if any, are completely reliable. The plot of the movie, such as it is, is that an old homosexual brings a beautiful, blond, butch hustler, played by Paul America, to Fire Island for the weekend only to have all his neighbors try to lure him away. Paul America had been discovered at a discotheque in 1965 and brought to the Factory. Born Paul Johnson, accounts also differ as to how he acquired his stage name, though as Warhol said, "he was unbelievably good-looking, like a comic-strip drawing of Mr. America, clean-cut, handsome, very symmetrical. He seemed to be exactly six feet tall and weigh some nice round number." America wound up living at The Factory from 1965 to 1968 where he was, according to Ondine, "everybody's lover.... He was the personification of total sexual satisfaction. Without a brain in his head. Just beautifully vapid."